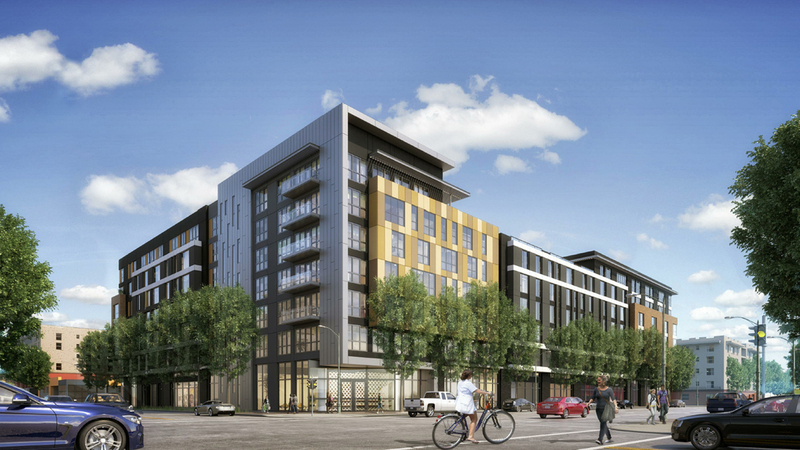 The 14th & Alice mixed-use project is designed with five levels of Type IIIA wood frame over two levels of concrete podium. The building will include 262 apartment units, ground level retail, a podium courtyard, roof deck and 197 parking spaces. The project is currently under construction. The project contains a concrete parking structure located above grade and centered within the plan. CKC not only provided structural design, but also made recommendations and suggestions regarding the parking layout and functionality. The structure contains a parking ramp which maximized the parking using the smallest amount of vertical space. The half level below grade was kept shallow avoiding the need for shoring. The shearwalls are completely removed from the exterior of the building and are only located on partition walls and corridors. Double sided shearwalls were not used as these cause difficulty for placing MEP systems. These cost effective approaches have been warmly welcomed by the owner and construction teams.